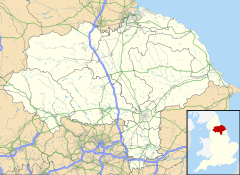 Kilton Thorpe is a village in the borough of Redcar and Cleveland and the ceremonial county of North Yorkshire, England. Noted for evidence of early settlement. The outlines of an ancient village are visible in fields adjacent to the present village. It is best observed under snowfall.